TCX welcomes professional investors from outside the United States to share in its activities and utilize its hedging capacity to support local currency investments with local clients. Most investors participate in TCX for strategic reasons, to hedge frontier market currency risk to support their business interests. By providing its investors with the ability to transfer their local currency risks to a centralized pool with focused management and better diversification than each can achieve on its own, TCX allows its investors to focus on providing long-term local currency loans to clients in frontier markets. TCX’s hedging capacity is preferentially allocated to its investors, their clients and parties introduced. 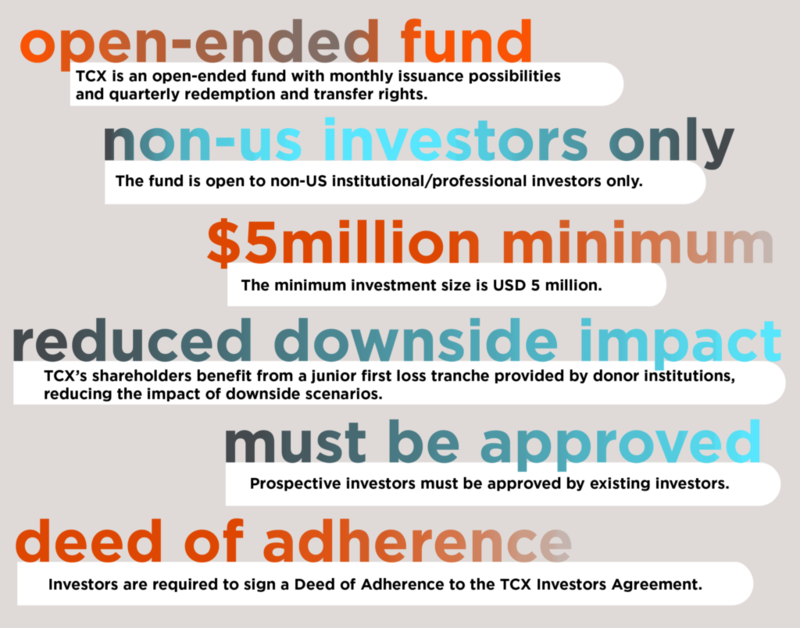 Some important considerations for investing in TCX are listed below. TCX’s Fund Manager is TCX Investment Management Company B.V. (TIM), a company based in Amsterdam, The Netherlands, that is licensed as an Alternative Investment Fund Manager by the Financial Markets Authority of The Netherlands. Interests in TCX may only be acquired by professional investors within the meaning of the AIFMD, subject to prior approval of the Fund Manager and existing Shareholders in TCX, and subject to a minimum initial investment of USD 5 million. Interests in TCX have not been and will not be registered under the US Securities Act of 1933, as amended, and can only be acquired by persons outside of the United States, and may not be offered or sold in the United States or to or for the benefit of US persons. TIM has passports in place to market the Fund in certain EU countries only. The marketing of the Fund outside the EU may also be restricted by law. TIM is dedicated to complying at all times with all applicable rules. Accordingly, no communications from TIM may be construed as an offer or invitation to invest in the Fund in any form in any jurisdiction where TIM has not yet taken steps to comply with the prevailing laws and regulations on the marketing of funds.